How do we learn and maintain a truly synchronized rhythm? A metronome. Musicians have been using them for years. Practice your putting stroke at home while listening to a metronome. 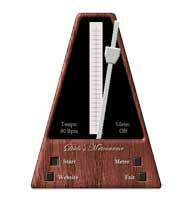 When I feel my rhythm slipping away, I listen to the metronome on my PC. I set it to 60 bpm which gives me a slow, long stroke. The beat is perfect for short and long putts alike. I start back on the first beat and make sure to be going thru the ball on the second beat. Eventually, I will be stroking the forward swing thru the ball area on the metronome tick. You may need slower or faster timing, but 60 bpm is a good starting point. This exercise provides both, an audible (metronome tick) and visual (putter passing thru ball strike zone) cue. This helps to hard wire the rhythm into your stroke. If, while playing, I lose the rhythm, I make a clicking sound, and swing my putter until I settle on the right beat. It's like having a metronome in your pocket. Now we have what we need to "Make All Three Footers": a natural slight inside to inside oval stroke, and a synchronized rhythmic stroke. So, lets start practicing. Take your new-found stroke out to the practice green. Find a flat, straight surface on the green. Measure out approximately 3 feet (one full stride) from the hole. Place 6 balls in front of you (cup holds about 6 balls). Hit every putt hard enough to hit the back of the cup. Remember to let your putter move on an oval line around your body, and keep in mind the rhythm set by your metronome. You don’t have to manipulate the stroke at all. Simply allow it to naturally go back and thru at your own natural rhythm. Only practice 3 footers …5 to 10 minutes, until you are making them all. Trust the stroke. The longer ones will drop by themselves as your confidence increases. If our putting stroke is rushed, too slow, or jerky, we are not allowing the natural movements of the body, nor allowing the putter to follow its natural elliptical pattern.